We’d love your help. Let us know what’s wrong with this preview of Congress of Secrets by Stephanie Burgis. In 1814, the Congress of Vienna has just begun. Diplomats battle over a new map of Europe, actors vie for a chance at glory, and aristocrats and royals from across the continent come together to celebrate the downfall of Napoleon…among them Lady Caroline Wyndham, a wealthy English widow. But Caroline has a secret: she was born Karolina Vogl, daughter of a radical Viennese In 1814, the Congress of Vienna has just begun. Diplomats battle over a new map of Europe, actors vie for a chance at glory, and aristocrats and royals from across the continent come together to celebrate the downfall of Napoleon…among them Lady Caroline Wyndham, a wealthy English widow. But Caroline has a secret: she was born Karolina Vogl, daughter of a radical Viennese printer. When her father was arrested by the secret police, Caroline’s childhood was stolen from her by dark alchemy. To ask other readers questions about Congress of Secrets, please sign up. For those of you who have read it is a YA book? Mary Not a YA book. I really enjoyed it. This is both my darkest and my most romantic book. It's my love letter to Vienna (my favorite city in the world). It's full of disguises, deception, dark alchemy and an unexpected romance between a powerful, ruthless, manipulative heroine (my editor described her as having "a spine made of steel") and a charming conman hero in the middle of his biggest-ever gamble, all set at the glittering Congress of Vienna. I love a well written, well thought out historical. Add some fact with fiction and just a touch of magic and you have something that I take notice of. Congress of Secrets was such an interesting, unexpected read. One that left me eagerly turning the pages curious at what would transpire next. What truths and deceit would unfold and what the author had in store for our main characters. There were twists, turns, darkness, and light. It was fun, entertaining and with just a touch of romance, it rea I love a well written, well thought out historical. Add some fact with fiction and just a touch of magic and you have something that I take notice of. Congress of Secrets was such an interesting, unexpected read. One that left me eagerly turning the pages curious at what would transpire next. What truths and deceit would unfold and what the author had in store for our main characters. There were twists, turns, darkness, and light. It was fun, entertaining and with just a touch of romance, it really was a fun read that I'm glad I took the time for. Burgis takes on a complicated, fascinating period of history--the Congress of Vienna--as the backdrop for this dark historical fantasy romance, as a troupe of actors attempt to find fame among the glitterati at the end of the Napoleonic wars, and a pair of con artists, separated since childhood, pursue their own goals among those gathered to dance, gamble, flirt, and negotiate the borders of Europe as they play the game of kings. The story is at its best with the actors, at least for me, especial Burgis takes on a complicated, fascinating period of history--the Congress of Vienna--as the backdrop for this dark historical fantasy romance, as a troupe of actors attempt to find fame among the glitterati at the end of the Napoleonic wars, and a pair of con artists, separated since childhood, pursue their own goals among those gathered to dance, gamble, flirt, and negotiate the borders of Europe as they play the game of kings. The entire alchemy thread doesn't seem to quite jive with the rest; I can't help feeling that if it had been excised, there would have been more time to develop the main pair more, and fit them better against the backdrop of the greatest and most elegant gathering of con artists in Western European history. Caroline Wyndham, a wealthy English widow, is among the guests and hopes to gain the Emperor’s ear. Caroline is not at all who she seems, although she plays the role to perfection. She w The year is 1814 and all the aristocrats and royals from across the continent have converged on Vienne for the Congress of Vienna to celebrate the downfall of Napoleon. It is a celebration but also a week of high politicking as each diplomat hopes to control again or be granted lands within the new map of Europe. Congress of Secrets was a suspenseful tale with bits of actual history woven into the story from events and historical characters to the study and practice of alchemy in the 1800’s. These added a believability to the story and grounded the quest Carolina was on and made Michael's scheme seem plausible. I loved her rendition of Emperor Francis and those of Count Pergen. The Count of Pergen was a sinister man in European history. His role in the Congress of Secrets will send shivers down your spine. thrilling and interesting story; great writing, interesting characters, though maybe the secondary ones were not as fleshed out, alot of times it felt like they were props, acting in a certain way just so the main characters could react to it and the story could go a certain road. that said, really liked the whole story and would recommend it to friends. since this is a historical fiction there’s an amount of political maneuverings and manipulations. so my only negative thing? not enough alchemy. I was lucky enough to be asked to read an ARC for this book. No spoilers, but you want this book. Dark magic, plots within plots, so much good stuff. 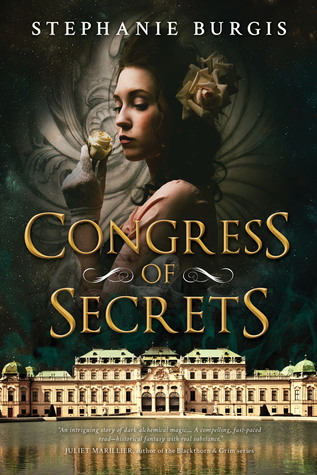 A sumptuous and romantic tale of two ordinary people caught at the confluence of history, politics and dark alchemy, CONGRESS OF SECRETS will have you turning pages late at night. Quick & Dirty: All the of world is a stage, and all the men and women are merely players. Opening Sentence: “Of course, I could never go back to Vienna,” Michael Seinhuller said. Michael is a con man or a player on the world stage and he has a play to set him up for life, he just needs some help getting into Vienna so he can get land, title, and money. When he runs into a troupe headed into Vienna he knows how to get them to help him. Once he is in, he just needs to find someone to introduce him the right people and he can implement his plan. Lady Wyndham is a wealthy English widow with a deadly secret. She is the daughter of a radical printer who was imprisoned over twenty-four years ago and she has a plan to find him and free him. When Michael accidentally runs into Lady Caroline he is stunned to realize that she is really Karolina, he is pleased to find her alive and well. She is not so happy to see him, she knows that he ran when her father was arrested and she hates him for it. However, fate throws them together and she arranges for him to stay with her secretary and introduces him to some powerful people in Vienna. Caroline is pleased when the Emperor is so taken with her, but little does she know, Count Pergen, the head of the secret police is busy looking into her past. Peter, the director of the troupe, is kidnapped off the street and interrogated about Michael, he realizes that they were used by him, but he is desperate to do anything to save his troupe. Michael is uncovered by the French ambassador and is blackmailed into helping him. Caroline doesn’t realize that the Count is hot on her trial and when her secretary feels betrayed he may sell her out in the worst way. Can they play the game and win or will they lose everything? I really didn’t know what to expect with this one and I was blown away. I absolutely loved the introduction of magic or alchemy in this book, and I was utterly fascinated until the end. I couldn’t put this down. Michael is a typical con man, but he really grows in this book and I can’t say enough about Caroline. To come back to Vienna after barely escaping from there, and to look the men in their faces and pretend that they don’t disgust her. Amazing character. She was fierce and strong, sadly despite not being so trusting she really didn’t see some of the things that happened coming. The mix of alchemy, actors, con men, suppression of ideas all came together to make an explosive story. I haven’t really ever thought about the Congress that took place in Vienna after Napoleon was defeated and Stephanie makes it all come alive. This was my first time reading one of her books and I can’t wait to see what else she has written. This really was a good read. I love this author's style of writing. She really can set a scene and make it appear effortless. I like how she builds her characters and I think she hits the nail spot on in terms of cutting back and forth between characters to create the maximum tension. Prince Kalishnikoff of Kenova is attending the Congress to seek reparation for the loss of his lands during the recent conflicts. In truth he is a charming con artist named Michael Steinhüller. In a strange quirk Michael was perviously a young apprentice to Karolina's father and the two have not seen each other since the night of the arrest. The two of them are about to once again meet and they'll need to keep their heads and their minds focused as their incredibly risky plans become inextricably entwined. I really enjoyed this story. It's a wonderful period drama with an intriguing plot, dark magic and a very subtle romance. Firstly to the characters. Karolina and Michael are very well developed, probably Karolina a little moreso than Michael. Their back stories are only slowly revealed and make for very interesting reading - I won't go into the ins and outs of them here other than to mention that Karolina seems to have suffered a rather horrible childhood of captivity and torture until her eventual escape. Michael has spent his time going from one con job to the next, relying on his charm but always in the realisation that he can only continue in this vein for so long and becoming desperate to find the perfect job that will enable him to quit. The other key players are the Emperor, an ambitious man who seeks power and wealth and doesn't mind how low he needs to sink in order to achieve it. His head of Secret Police is Count Pergen, a dark and twisted character who has practiced such dark alchemy that his very soul seems to have been consumed. We also have the involvement of a travelling theatrical company led by the young Peter Riesenbeck - another character who longs for success and hopes to stage his next show at the Congress. Unfortunately Peter unwittingly falls foul of the secret police and becomes embroiled himself in a desperate situation of life and death. My favourite of the piece was probably the wily Prince de Ligne. He doesn't play one of the main roles but nonetheless he's a great character. An older man of notoriety, now fallen on slightly harder times due to a disagreement with the new Emperor. I liked him, he's one of those characters that feels trustworthy and fatherly and I couldn't help thinking that he would come to the rescue somehow. In terms of plot. There's plenty going on here. Political intrigues, two people trying to pull their own perfect con job. A travelling troupe with an ambitious manager and an Emperor who desires power. In terms of criticisms - well, only a couple of small ones, observations really more than criticisms. Being the second book I've read by Burgis I would say that she is great at writing historical novels that twist the real and the fictional into a compelling read. I'm not quite sure that this particular story needed the dark alchemy although it did add the notes of fear and tension - I just wonder if the thought of capture, arrest and torture might have stood just as well - that being said, I do love reading a bit about alchemy and it certainly seems to fit well in a period novel. The other point that I did struggle a little bit with was Karolina's reason for the visit - I found it difficult to believe in but I can't really elaborate on why without spoilers. I would definitely recommend Congress of Secrets. The romance is very subtle and doesn't overwhelm the story and the fantasy elements similarly don't take over the plot. Well written with lots of tension and the sort of book that once I finish it I want to go and explore the history of the period a little more - which is exactly what I've done now with both books by this author. Last April I read Stephanie Burgis’ Masks and Shadows , her first novel for adults and fell absolutely in love with her writing. So I after I finished the book, I was really happy to discover that she had a book set in the same variant of our world coming out in November of last year. Congress of Secrets was everything I hoped it would be and more, taking what I loved about Masks and Shadows and improving on the things that niggled me. Burgis enchanted me once again with Caroline’s tale and I w Last April I read Stephanie Burgis’ Masks and Shadows , her first novel for adults and fell absolutely in love with her writing. So I after I finished the book, I was really happy to discover that she had a book set in the same variant of our world coming out in November of last year. Congress of Secrets was everything I hoped it would be and more, taking what I loved about Masks and Shadows and improving on the things that niggled me. Burgis enchanted me once again with Caroline’s tale and I would have loved to have spend even more time in this world. While Congress of Secrets isn’t a sequel to Masks and Shadows, it is set in the same world and there are clear links between the books in the background. The book is set during the Congress of Vienna, the large conference that was held after the Napoleonic wars to settle the peace accords. It is a part of history I didn’t know much about, being more familiar with the French occupation of the Netherlands and what happened here after the French left. So more small stage than the large arena of the Congress. Burgis invokes Vienna and the strained atmosphere that accompanies a meeting between former foes to forge a peace of necessity vividly and I loved the court scenes. It is in this fraught setting that Caroline and Michael meet again. I loved that while neither are who they were before, they each recognise the other’s true identity immediately and that each still looms large in the other’s motivations, though not exactly in the same way. The way Michael and Karolina regard each other and treated each other is light years removed from how Lady Caroline and Stefan, Prince Kalishnikoff interact with each other and Burgis manages to interweave the tensions of both situations yet keep them distinct at the same time. The romance between Caroline and Michael is wonderful and well-structured. The added hurdle of their tangled identities and pasts only increases the satisfaction of seeing them truly connect. But while their romance is important to the story, both Caroline and Michael have independent emotional arcs to fulfil in the narrative that are interesting in their own right. They both need to conquer the ghosts of their past and find a way forward by forgiving their younger selves. I found Caroline’s arc especially affecting, given her desire to rescue her father and her willingness to sacrifice anything to find him. Caroline and Michael have a firm friend and ally in the form of the Prince de Ligne, who really stole every one of his scenes. He was such a roguish charmer and an excellent co-conspirator as well. And they sorely need his aid against the villainous Emperor Francis and his chief advisor Count Pergen, both of whom were just freaking scary and unpleasant individuals. The combination of their supernatural dealings and their use of their ruthless secret police was a chilling one. I’d never heard of the Habsburg secret police force before, but their actions and methods were awful, even if you set the supernatural aside. One final viewpoint that plays a large part in the story is that of the theatre company owner, Peter Riesenbeck, who was also a great character. I felt so sorry for him as he wanted to do the right thing so badly and that was exactly what kept putting him in harm’s way. He gave an outsider’s perspective and showed the true horror of the state’s misdeeds under the direction of Francis and Pergen. Besides, I loved his scenes with his theatre company, as Burgis paints Peter’s principals without covering up any of their flaws and shows human nature in all its awful glory. Congress of Secrets is a wonderful story that I absolutely loved. Stephanie Burgis proves once again that she can write a cracking story, no matter whether she’s writing for children, young adults, or adults. If historical fantasy is even remotely your thing, you shouldn’t miss Congress of Secrets. Widow of questionable nobility wields flirtation as a weapon at court while an unconventional love lurks in the background, spies use alchemy, a theatre troupe gets twisted up in it all, and the great reveal is on stage. It is 1814 and the Congress of Vienna has made Vienna the place to be for schemers of all sorts. The kings, emperors, and diplomats are scheming to divide up Europe now that Napoleon has been deposed. The well-to-do from all over Europe are gathering to be part of the social scene. Two others have come to Vienna again for their own purposes. Caroline, Lady Wyndham, is searching for her father who was arrested for political dissent when she was eleven. She fell under into the control of the Austri It is 1814 and the Congress of Vienna has made Vienna the place to be for schemers of all sorts. The kings, emperors, and diplomats are scheming to divide up Europe now that Napoleon has been deposed. The well-to-do from all over Europe are gathering to be part of the social scene. Caroline, Lady Wyndham, is searching for her father who was arrested for political dissent when she was eleven. She fell under into the control of the Austrian Emperor's head of the secret police. Count Pergen used her in his alchemical experiments and kept her imprisoned for four years. At fifteen, she was sold to an English Alchemist. She has managed to build a life for herself as an English peer. Now widowed and with the war in Europe over, she can finally travel to Vienna to try to find and rescue her father. Michael Steinhuller has also come to Vienna to try to make his fortune. He has spent the years since his master was arrested for sedition living as a con man. Now, he wants one final score to secure his future. However, the secret police are still looking for him. One other prominent fictitious character is Peter Riesenbeck who is the owner of a theatrical troupe and who hopes that Vienna will be the place where they can make their fortunes. Michael uses them to smuggle him into Vienna. His use of them brings Peter to the attention of the secret police. Another fictitious character is Charles Weston who is Caroline's secretary and a student of Alchemy. When Caroline disappoints his hopes, he throws himself in with Count Pergen. The story is also filled with historical figures from Emperor Francis to Talleyrand to the Prince de Ligne who have large parts in this story and countless diplomats and society people who make up the background characters. I didn't like this one as much as I liked Masks & Shadows. I think the ending just kinda blew it for me, and there were other aspects where I was just like, what? Not my favorite. Review originally published in Booklist on October 15, 2016. Set during the historical backdrop of the Congress of Vienna, which occurred after the defeat and exile of Napoléon Bonaparte, this novel is not only about the lengths political leaders will go to gain power but the lengths a daughter will I didn't like this one as much as I liked Masks & Shadows. I think the ending just kinda blew it for me, and there were other aspects where I was just like, what? Not my favorite. For some reason Masks and Shadows matched my taste, or my mood at the time of reading, a bit more than Congress of Secrets, but this was still a very good read, with vivid characters and a roaring good story. Once I read the synopsis for Congress of Secrets a few months ago, I knew that I HAD to read it! Historical fantasy novels are quickly climbing up my list of favorite things to read and this one looked beautiful. , it didn’t just have the looks- this book had awesome content, from the setting to the characters, to the devious plots. I thought Lady Caroline Wyndham was superb- she was beautiful, conniving, and clever. She managed to go from a printer’s daughter to a wealthy lady of English high society. Caroline had valiant intentions, though at times I wondered if she was somewhat too naïve or starry-eyed to think what could happen to a person in 24 years. It turns out she was a little naïve, or perhaps overly hopeful in the end. Michael (or should I say Prince Kalishnikoff) knew Caroline when they were children in Vienna, though they both went their separate ways rather abruptly after Caroline’s father was taken prisoner by the Austrian Secret Police for printing pamphlets decrying the state of the nation and the actions of the emperor. The two come together during the Congress and both are trying to maintain their facades and play a complicated and dangerous game. It took me awhile to get really hooked on the plot, though from the very beginning it was clear that it was my kind of story. It’s really a story of con artists and impersonators with noble intentions- I love stories like this, so I can’t really say why I wasn’t on board from the get-go. The addition of alchemy as a thing of terror was underwhelming in my opinion, it almost detracted entirely from the quality of the book. It’s like it just wasn’t sinister or present enough to make a real impact. Sure, it was made to be a significant part of the plot, but it felt like a puzzle piece that worked, but wasn’t a perfect fit. Alchemy maybe could have been more properly introduced, or more present. I did like this story quite a bit, though I didn’t love it. Overall, I was detached from the characters, which I thought could have benefitted from a more detailed background. If the story had run from the fateful day when Caroline’s father was taken in by the police to the conclusion I think the reader could and would be more empathetic towards both Michael and Caroline and the sinister Count Pergen would have actually been sinister rather than vaguely discomfiting. As a whole, it was a lovely piece of historical fantasy, with lots of actual historical figures that played significant roles in the Congress of Vienna (I googled them to see what they actually did). I’ve always thought books like this are a great way to get people- myself included- more interested in historical events and provide a spark that makes a person want to go out and learn more on their own! The year is 1814, and the Congress of Vienna has just begun. The Emperor Napoleon has been defeated, and the great powers of Europe have gathered in Vienna to carve up Europe among themselves. Along with them have come the powerful, the deposed nobility of old Europe, and the opportunistic, hoping to grab power and wealth for themselves. Amid glittering balls, parties, and salons, the great of Europe meet, plot, and position themselves. Into Vienna come Lady Caroline Wyndham, a wealthy English wi The year is 1814, and the Congress of Vienna has just begun. The Emperor Napoleon has been defeated, and the great powers of Europe have gathered in Vienna to carve up Europe among themselves. Along with them have come the powerful, the deposed nobility of old Europe, and the opportunistic, hoping to grab power and wealth for themselves. Amid glittering balls, parties, and salons, the great of Europe meet, plot, and position themselves. Into Vienna come Lady Caroline Wyndham, a wealthy English widow, and charming con man Michael Steinhüller. Both of them have secrets. Caroline was born Karolina Vogl, daughter of a radical Viennese printer. Caroline’s father was arrested by the secret police and her childhood was cruelly stolen from her by dark alchemy in the cells of the secret police. Michael, meanwhile, was once the apprentice of Caroline’s father. Neither has seen the other since their childhoods were shattered, and both have returned to Vienna with plans of their own, Caroline’s to save her father, and Michael’s to pull one last con before he retires. Neither of them expect to encounter the other, and when they do, both their plans will be in danger, and so will they. I’ve said before that a really well-researched piece of historical fiction can be as full of wonder as the most inventive fantasy or science fiction novel, and this historical fantasy proves that. Every scene comes alive with wonderful, vivid, and sometimes alien detail that make you feel like you’re really there. I lived for six months in Vienna, and in Congress of Shadows, I really felt like I was back there, strolling around the first district or through the royal palaces. This is lush and all-enveloping. The characters, too, are incredibly involving and well-conceived. From the moment you first meet Caroline, Michael, and the third main character, Peter Riesenbeck, you are swept into their stories, their fears, their desires, and their plans. But it’s not just the main characters who are so believable and enticing. There is also a whole array of historical figures – from the quipping Prince de Ligne and the paranoid Emperor Francis to the manipulative head of the secret police, Count Pergen – and fictional counterparts who leap off the page. The story is fast paced and increasingly tense as Caroline, Michael, and Peter’s plans begin to crumble in the face of the dark alchemy wielded by Count Pergen. Finally finally finally bought this, and I am so confused as to why this book doesn't have more attention. There is an amazing historical setting (the Congress of Vienna of 1814! ), fantastic characters that develop lovely and at just the right place, a romance that suits the story brilliantly and that I, for once, adored and rooted for, villains of nightmares, and alchemy (magic of a new sort to me, and I thought it was so inspired and unique).. I have no complaints. While the first p 4-4.5 stars. While the first part of the book may be a bit slow-paced for some, I for one loved character introductions and the politics and the world building. And I didn't think it was particularly slow at all, with things happening constantly. A clever plot with a great and utterly satisfying ending. I was hoping so badly that I would fall in love with this book because I mean, just look at the cover! And I am happy to admit that I did indeed fall for this. I'll definitely re-read this one in the future, and I might check out the author's other adult books! I'm just a sucker for historical fiction with action and adventure like this one. Another enjoyable, rich historical fantasy for adults from Stephanie Burgis. As always with Staphanie's books, I was fully immersed in the world she created. I loved the mixture of politics with alchemy. I enjoyed this slightly less than Masks and Shadows only because I felt more of a distance from the main characters. I still loved it, particularly everything about the world building and intrigue. An intriguing historical fiction novel with just the right touch of romance and necromancy, and an informative historical note which always makes me happy! One make-out scene that is disrupted with clothes still on (but you definitely know where it is going). This is an adult book, with some adult themes, but still much cleaner than a lot of YA (I'm looking disapprovingly at you Sarah J Maas). Historical fiction - check. Elements of fantasy - check. Intricate caper plot - check. This book should have been right in my wheelhouse, but it just wasn't. The fantasy alchemy elements felt tacked on. It was slow to start, and I never really felt attached to the characters. Finishing felt like a chore. The historical bits were the redeeming feature. I wouldn't mind finding another book set against the same backdrop. Too heavy on the historical side for my cold-medicine filled brain right now. This was a fun one: court intrigue, magic, history, power, revenge, and a little romance. It might be easy to understand why I enjoy reading Stephanie Burgis's combination of real 18-19th century history, romantic adventure, and touches of magic. She has an impressively solid familiarity with the history and manners of the era she draws from (which, if you check out the topics of her graduate education, is no surprise). The Congress of Vienna, sorting out the political consequences of Napoleon's defeat, is a natural setting for intrigues of all sorts. Two people, neither of whom is th It might be easy to understand why I enjoy reading Stephanie Burgis's combination of real 18-19th century history, romantic adventure, and touches of magic. She has an impressively solid familiarity with the history and manners of the era she draws from (which, if you check out the topics of her graduate education, is no surprise). The Congress of Vienna, sorting out the political consequences of Napoleon's defeat, is a natural setting for intrigues of all sorts. Two people, neither of whom is the person they current portray, encounter each other in the build-up to the Congress for the first time since a violent separation when they were children. Michael, once apprenticed to a political pamphlet printer, has survived by learning the arts of the con man and has arrived as the disenfranchised Prince Kalishnikov, hoping to restore control of the realm Napoleon stole from him--or at least to convince someone to pay him off to go away. Karolina, the daughter of that printer, fell into the hands of the head of the Austrian secret police, who maintains his power by alchemical rituals that drain energy from his victims. Handed off to be the plaything of an English aristocrat, she turned her situation around and became the (now widowed) Countess of Wyndham. Her goal at the Congress is to free her father from the secret prison where he's been held for decades and, if possible, to avenge herself on those who held him there. Their accidental reunion in Vienna could spell disaster for both their plans--or each just might have found the only ally that could ensure success. I enjoyed the casual details of the setting and historic personalities, as well as the solid back-story for the central political tensions. The rich diversity of early 19th century Vienna came alive on the page. And if I occasionally felt that certain bits of the historic background were being repeated more often than I needed, keep in mind that I'm on the far end of the scale of "just give me a hint and I'll be fine," as well as being a bit more grounded in the historic outlines than the typical reader. The interpersonal interactions driving the plot worked very well for me for the first three-quarters of the book, including the completely expected growing romantic tension between the two protagonists. Very much in the genre of "I'm totally attracted to you but I can't trust anyone--and especially not you--so giving in to it would be a fatal mistake." The romantic tension was only slightly spoiled by a few too many (in my opinion, unnecessary) incidents of "I saw you smiling at so-and-so, which means you're actually going to bed with them, so my heart is broken, not that I'll admit that I cared." But in the climax of the book, my suspension of disbelief slipped a little. Too many key players were too easily convinced, too quickly, to believe the protagonists' stories in the nick of time, and to pitch in at the risk of their own lives and careers, or to back down from opposing them far too readily. I had anticipated the fate of one key character from the very beginning--a fate that it was essential for the protagonists never to consider seriously. The strongest point in the climax was our heroine contributing actively and believably to her own rescue, rather than becoming a damsel. Set in the same world as the author’s Masks and Shadows, Congress of Secrets takes place in Vienna, 1814 at the great Congress of Vienna which marked the end of Napoleon’s rule across Europe and the meeting of leaders from countries both subjugated and victorious in the wars that deposed him. Against this backdrop, Caroline, a wealthy English widow and tourist at the Congress ingratiates herself with the players and noble onlooker. Unbeknownst to them, she is playing a part, returning to Vienna Set in the same world as the author’s Masks and Shadows, Congress of Secrets takes place in Vienna, 1814 at the great Congress of Vienna which marked the end of Napoleon’s rule across Europe and the meeting of leaders from countries both subjugated and victorious in the wars that deposed him. Against this backdrop, Caroline, a wealthy English widow and tourist at the Congress ingratiates herself with the players and noble onlooker. Unbeknownst to them, she is playing a part, returning to Vienna and her childhood home on a mission to face a villain and perform a rescue. Hijinks and plotting ensue, as Caroline tangles with the dark forces behind the powers collected in Vienna. I took the European History AP test (I got a 5!!! /brag) and consider myself to be a history buff and yet, I could barely remember what happened during the Congress of Vienna. Shame on me. Because it seems hella important to how the shape of Europe between Napolean and what we think of modern Europe ended up and because it was also apparently an amazing circus with heads of state, power-hungry politicians, nobility both with and without their lands, and assorted gawkers, revolutionaries, and concerned parties. Into this spectacle, Congress of Secrets is concerned with Caroline, a grown woman and a widow, who is in control of her wealth and destiny, with a mission of revenge and rescue. Sure, like Masks and Shadows, we get multiple points-of-view, including Caroline’s childhood friend Michael, also returning to Vienna to confront his own ghosts and secure his future, as well as the director of a troupe of players, Peter, who gets caught up in Michael’s machinations as well as those of the paranoid head of the Emperor’s secret police, but this is Carolina’s show. The elements of the story that I really appreciated were again that our heroine was no adolescent girl, but an adult woman who can plot and maneuver with the best of them. Also, *spoilers* she basically saves herself in the end, while Michael, who is most definitely the romantic lead and our hero, gets sidetracked and basically talks his way out of trouble instead of punching his way out. I am most definitely here for more historical fantasy set outside of Regency England starring grown-up and competent ladies. Also, since Caroline's PTSD is important throughout the book, I guess we didn't need MORE of it at the end, but I felt the denoument was a little too short, and told from Michael's point of view entirely, so Caroline didn't really get enough closure. Overall, however, I was very satisfied by her story. That said, I like what Burgis does with setting and character, and I still liked much of the book, just not nearly as much as I've liked the author's other works. The Regency period in Great Britain is the single most frequent setting for historical romance, and it's always nice to get a glimpse of other parts of Europe at the same time period, and Vienna is a really great setting for examining The Enlightenment as well, since it had been such a hub for culture and ideas, until Joseph II became completely paranoid after the assassination of his sister in France.